Elephant is very proud of his umbrella but he is always happy to share it when it rains. One day a gust of wind blows the umbrella away from him and into the hands of a leopard who is delighted to have it. The umbrella is quite particular about her owners however and decides to check what the leopard plans to do with her. The leopard’s reply involves hunting and eating anybody he sees under it. The umbrella doesn’t approve of this and asks the wind to take her with him again. This time the wind takes her to a bear who wants to sit under the umbrella while eating all the bees’ honey himself. 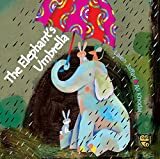 Again the umbrella isn’t happy with this idea and chases after the wind once more until she is blown back to the elephant who is very happy to be reunited with her. Generously, he immediately invites other creatures to share the umbrella with him. The Elephant’s Umbrella is a beautiful picturebook and an enjoyable read. The story is simple but has a clear message about the difference between sharing what you have and being selfish. It would have been fun to hear a little more of the umbrella’s adventures with perhaps one more unsatisfactory owner, but perhaps children may have their own suggestions. The repetition and pattern to the story would make it fun for children to join in with once familiar with the story. The illustrations are stunning, a vibrant colour scheme is interrupted only by the menacing black rain cloud. The hardback cover includes a pleasingly shiny umbrella and raindrops you can feel. This story by an Iranian team is another picture book from Tiny Owl; a publishing company which aims to promote diversity and bridge cultures by introducing exciting new picturebooks from talented authors and illustrators across the world.